In 2018, both the Apple App Store and the Android app market will be celebrating their 10-year anniversaries. Since they launched, apps have taken over the world in a huge way, transforming industries and evolving from smartphone-only experiences to platforms controlling homes, TVs, cars, etc. The momentum for apps has been growing – and this is just the beginning. By the end of this year it’s estimated that more than 40 countries will generate over $110 billion in consumer spend across both iOS and Google Play app stores in current markets, in emerging markets, and from innovation. While mobile presence and app growth is massive already, the years ahead will be even bigger as – technology advances, markets mature, and infrastructure is built for the next generation of networks and devices. Apps with IoT, AI, AR, VR, Voice, etc. The past decade has seen tremendous growth in mobile- and touch-centric apps and their varied use cases. Looking ahead, a hallmark of the coming decade will be the extension of apps into everything — leveraging new UIs, especially voice, for interaction. Amazon drove the charge towards a voice-controlled future with its Echo device, first launched in 2014 and this past holiday season we saw the Alexa app drive more than 2 million downloads on Christmas Day alone. Today there are several voice assistants on the market, and thousands of apps have been developed to help consumers take advantage of their many use cases. Existing voice agents are being reinvented, and new entrants are building their own tools – to capitalize on the interest and opportunities with these devices, especially for entertainment and the home. Cable providers have integrated voice recognition into TV remotes to help consumers more easily find the shows and channels they seek. Philips has developed smart light bulbs that respond, via a mobile app integration, to voice commands that dim, brighten and turn on and off. The coming years will see not only higher adoption rates, but also deeper integration of voice command features into touch-based apps for a world where the internet and apps control many things. App personalization is a huge advantage when the User receives what they want / when they want / how they want ; quickly and easily – either when the information is requested, or better, by a notification (through an automated process based on specific preferences, parameters, metrics, algorithms, etc.). This makes technology extremely useful, seamless with life style, convenient, and very complementary to their activities or plans. By making it easy ” to know “, in addition to being a big benefit to people, it’s significant opportunity to the associated organizations and ecosystems to better serve and engage with their community to increase relevance and revenue. Pokemon GO and Snapchat introduced augmented reality (AR) to the mainstream, but so far we’ve only seen a glimpse of AR’s full potential. As we look to the year ahead, anticipation is building for Niantic’s launch of Harry Potter: Wizards Unite, which will take AR in gaming to new heights. And major companies are identifying business use cases to take AR a step beyond the existing consumer applications. 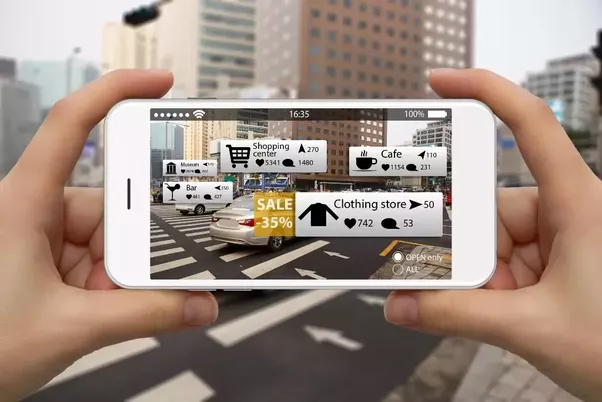 For instance, retailers like Ikea, Nordstrom and Pottery Barn have AR-driven app features to help shoppers visualize how a product will fit in their home. Additionally, Strava and BMW have also enhanced their mobile apps with AR features to create more immersive, visual experiences for their users — whether for tracking a run or buying a car. Further, with Apple and Google announcing AR initiatives at their 2017 developer conferences, it is expected we’ll see the fruits of these efforts become more apparent going forward. Glance-centric use cases in particular will rise from app publishers looking to enter this market as early AR adopters. Consumer interest in these apps is already spiking with expectation that excitement and downloads will meaningfully climb as further AR applications are released. App functionality is expanding as indicated above, plus workflow / processing, extensive interfacing / API support, location awareness, being context sensitive, etc. This provides the ability to deliver simple to sophisticated apps to expand the opportunities to resonate with current Users and attract new Customers, better serve current markets as well as to successfully grow and enter new markets. Further, by utilizing apps more, this enables organizations to fast track moving to a self-serve business model, become more agile and efficient in people performing tasks, etc. As well, since apps improve the User experience, deliver more value to Customers, internal Users and Partners, help better manage the business and have more efficient operations, etc. – apps are a strategy to meaningfully improve business outcomes. As we pass the ten-year app store anniversaries, the iOS and Google Play stores achieved record revenues ( ~ $17 B in Q3 2017). Extending on this, continued increases in the number of mobile users as well as time spent in apps approaching 3 hours per day, subscription revenue and in-app purchases will further accelerate app growth and improve business outcomes as enterprises increase their presence in the strategically important mobile market. In conjunction with this, app monetization will reach new heights globally and increasing consumer spending in China – that further builds on its established top ranking in the iOS App Store. On Android devices, emerging markets Brazil and India saw significant growth in time spent in mobile apps this past year, and they’re just getting started as both of these countries, as well as other major markets where there are still large populations to be served by smartphones. As this occurs and mobile becomes more pervasive in markets more deeply, it is expected that additional time and money will be spent in mobile apps. And extending on app monetization from consumer spend, in-app advertising and expanding mobile commerce mean the growth opportunities are still huge. Further, as enterprises become more innovative by extending business capabilities in mobile to increase relevance and revenue, there are significant additional opportunities with apps. technology advances, infrastructure is provided for the next generation networks and devices, etc.